At Sussex, you’re taught by today’s leading chemists, whose research is making world-changing impact in many areas, including renewable energy, drug design and cancer, and making the world’s tiniest magnets. the principles of lasers and their application, amongst other areas. 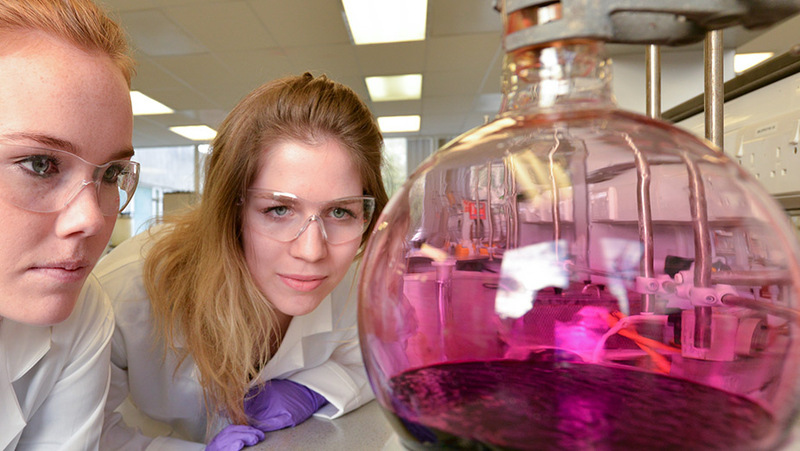 In your integrated Masters year, you’ll develop advanced research skills by working alongside our world-leading staff in Chemistry on ground-breaking discoveries. There are also paid research placement opportunities during the summer holidays. You can also take an extra year to do a professional placement or study at an international university. This course is accredited by the Royal Society of Chemistry (RSC). We also offer this course without summer research placements, with an industrial placement year, or as a three-year BSc. Find out about the benefits of an integrated Masters year. A-levels must include Chemistry, at least grade A. You will also normally need to pass the separate science practical assessment in Chemistry. If you are not able to take the science practical assessment, applications will be considered on a case-by-case basis. You will also need GCSE (or equivalent) English and two science subjects with grade 5 (or grade B) in each and grade 6 (or grade B) in Mathematics. We will consider you for our MChem and BSc degrees. 36 points overall from the full IB Diploma. Higher Levels must include Chemistry, with a grade of 6. You will need an A-level in Chemistry, grade A, in addition to the BTEC Level 3 National Extended Diploma. Highers must include Chemistry, at grade A. You should normally also have an Advanced Higher in Chemistry (grade A). You will also need Scottish National 5 in Mathematics and English at grade B. You will also need GCSE (or equivalent) English, Mathematics and two Science subjects with grade B in each (or in the new grading scale grade 6 in Mathematics and grade 5 in English and two sciences). Evidence of existing high level of academic ability in Chemistry is essential (normally with a final grade of at least 8.5). Relevant state (Year 12) High School Certificate, and over 95% in the ATAR or UAI/TER/ENTER, or a Queensland OP of 2 or better. Evidence of existing academic ability in Chemistry is essential. Reifeprüfung or Matura with an overall result of 1.6 or better for first-year entry. Evidence of existing high level of academic ability in Chemistry is essential. Maturatna Svjedodžba with an overall score of at least 5. Højere Forberedelseseksamen (HF) or Studentereksamen with an overall average of at least 10 on the new grading scale. Pass Ylioppilastutkinto with overall final result of at least LEEE, which must include Chemistry - grade L.
French Baccalauréat with overall final result of at least 14/20. You will need to be taking the science strand within the French Baccalauréat with a good result (13/20) in Chemistry. German Abitur with an overall result of 1.6. You will need a very good final result in Chemistry (at least 14/15). Apolytirion with an overall average of at least 19 will be considered for first-year entry. You must also have either Apolytirion pathway in Chemistry with a score of 20 or the Pan Hellenic in Chemistry with an overall score of 18. Erettsegi/Matura with a good average of at least 55555. Irish Leaving Certificate (Higher Level) at H1,H1,H2,H2,H3. Highers will need to include Chemistry, normally grade H1. You must also have a good level of Mathematics and English. Italian Diploma Di Maturità or Diploma Pass Di Esame Di Stato with a final Diploma mark of 90/100. Sijil Tinggi Persekolahan Malaysia (STPM) with grades of AAA, Matriculation with a least a grade of 3.5 or UEC with an overall average grade A2 (80%). Evidence of existing ability in Chemistry is essential. Our entry requirements are guidelines and we assess all applications on a case-by-case basis. Pass Matura with least 3 Extended level subjects in the 85th percentile including Chemistry. Diploma de Ensino Secundario normally with an overall mark of 18/20. Diploma de Bacalaureat with an overall average of 9 including a score of 8 in Chemistry. Spanish Título de Bachillerato (LOGSE) with an overall average result of at least 8.5. Fullstandigt Slutbetyg/Högskoleförberedande Examen with a total of 2,500 credits to include A grades in the majority of subjects and to include grade A in Chemistry. Advanced Placement Tests with scores of 5,5,5 in three subjects. Each summer throughout your degree (except your final year), you can apply for a research placement based in the Department of Chemistry. You’ll work on cutting-edge projects and contribute to the work of the research group you’re placed with. It’s a stimulating intellectual challenge, where you can hone your research skills and gain practical experience for a research-based career. You’ll receive funding to cover your living expenses during any placements you take. Optional book bundles are available from the University for around £165. These texts are also available online and from other outlets.